For the sake of innovation while producing high-performance clothing adapted to all types of riders, CKX presents its 2019 collection that will appeal to the most demanding riders. Already having a strong reputation for quality, CKX is strengthening its position acquired over the recent years, with amazing stuff. 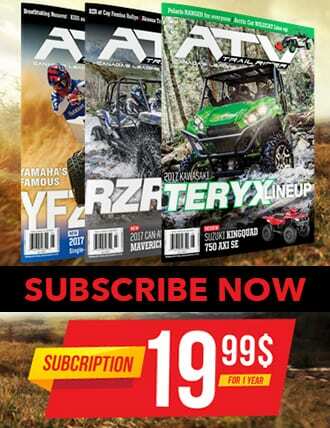 CKX’s 2019 collection offers both flamboyant and sober colors for backcountry enthusiasts as well as trail enthusiasts. CKX pushes the limits with audacity and originality and supports its novelties by actively listening to comments made by a team of ambassadors, who test day-after-day the clothing line in extreme conditions. The result is, CKX offers a collection that represents the expectations of its customers. We hoped at the chance for some equipment for a comprehensive test and for a thorough analysis of some elements that make up the 2019 winter collection. The versatile and appreciated 3-in-1 Husky jacket is back in force with new colors this year. This jacket can be adapted according to your needs thank to its removable 120g lining. Its 60g outer shell allows an adaptable and warm jacket, offering the necessary insulation to face the extreme coldness of winter. Available in 4 stylized versions, we chose to ride the winter trails with the charcoal, yellow and black version. We can honestly mention that we have not gone unnoticed with these colors. At first glance, we were not totally convinced of the harmony of this layout, but over time, we appreciated this upheaval in our conservative habits. We must admit that backcountry enthusiasts often like to look pretty casual, and the Husky jacket offers that uncomplicated look. One of our first observations is – it is light weight. The choice of material used in its fabrication makes it lightweight and offers all the mobility required to perform the desired tasks. 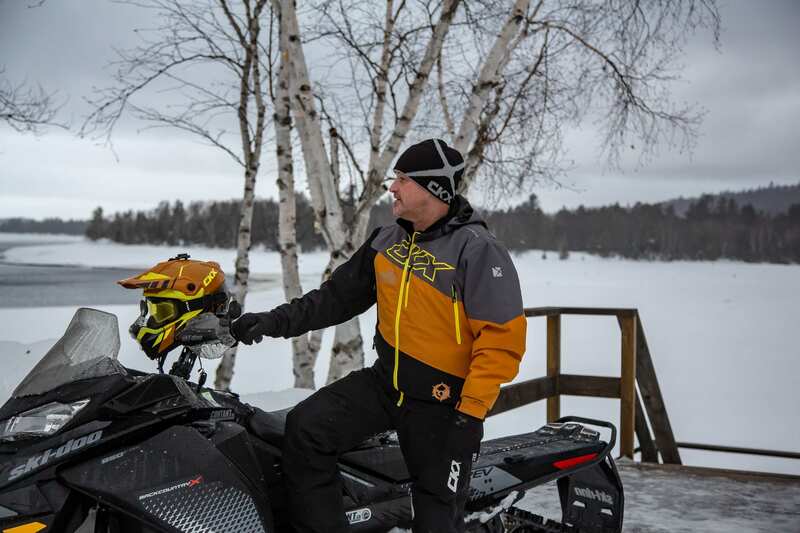 The Husky jacket offers the versatility to face all winter conditions, no matter the activity or the circumstances. The outer shell provides a barrier to water, cold and wind, while the inner lining provides unparalleled insulation and comfort. In colder trail conditions, where effort is minimal, the combination of lining and outer shell offers a protective armor to counter extreme cold. During a more sustained physical effort requiring intermediate insulation, the removal of the lining can still keep you warm. Its flexible, hermetic design and its technical capabilities are paired with its design. The zippers and seams are sealed against water infiltration, leaving the occupant dry at all times. This feature is great for long, comfortable rides. It’s the small details that make all the difference. Note the expandable sleeves that slip into thumbs for a perfect fit. This feature prevents the sleeves from retracting during movement and at the same time provides constant protection for the wrists. The previously mentioned attributes are worth its purchase without a doubt and that’s what makes it a best seller at CKX. No need to carry a different coat or jacket for each type of activity, the Husky jacket is made to be adapted to any situation. 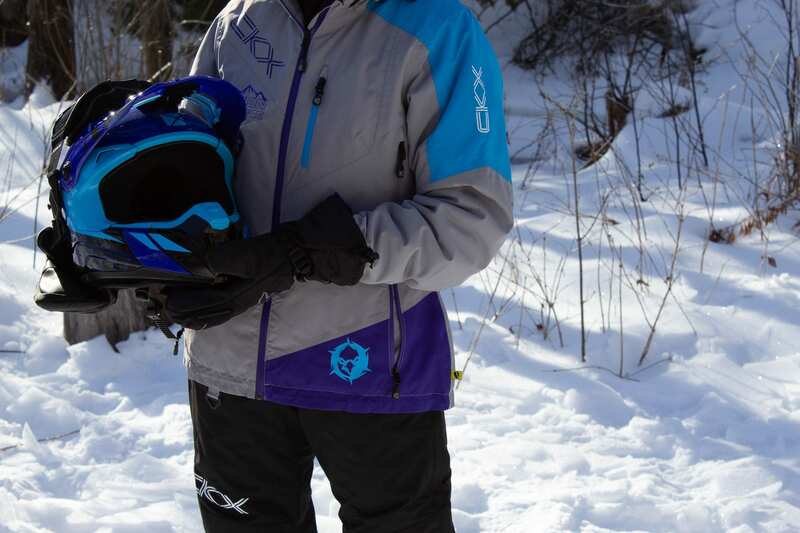 Those who enjoy both trail rides and backcountry getaways will find their way into CKX Montana jackets. This is the female counterpart of the Husky men’s jacket available this year. 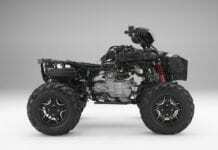 The Montana is offered in 3 different styles to please all riders. This time, we got our hands on the Navy Blue, Silver and Blue color scheme. Its aesthetic and eye-catching look was unanimously acclaimed everywhere we went. Just like the men’s jacket, the Montana is equipped with a removable liner. It is a 3-in-1 jacket that allows adaptation depending on temperature, conditions and activity. On the other hand, its feminine look and refined style highlight the determination of the female rider. It is offered with an inner lining of 120g with an outer shell of 60g. This high-end Montana jacket is characterized, just like the Husky, with a lightness and efficiency more than surprising. We could wrongly believe that the designers might have neglected certain aspects to achieve a jacket design of such thinness and flexibility. However, they have achieved a tour de force to reach this high level of excellence. Their experiences and active listening to user’s recommendations have made it possible to create a versatile jacket while offering a foolproof protection. 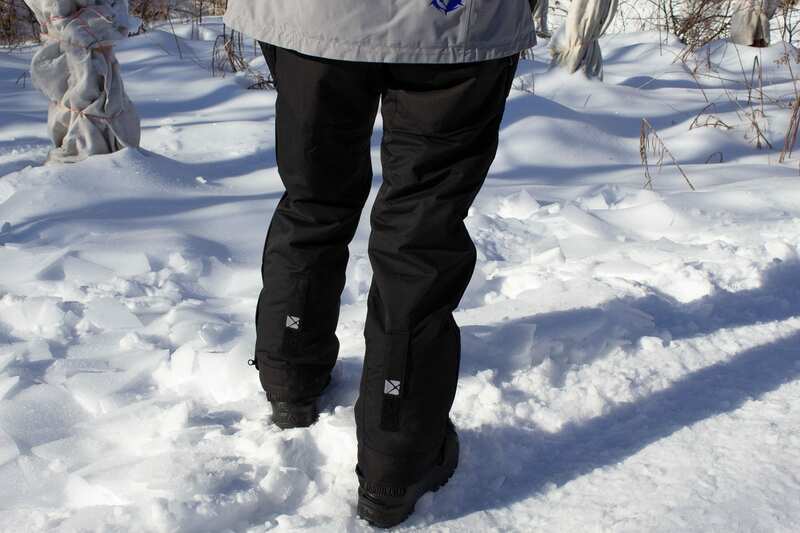 CKX offers several escape pants that adapt to the rider’s needs. Among these, the Husky for men and the Valley for women provide a low to moderate insulation level according to the climate. For our part, we set our sights on the Echo winter pants to match the men’s and women’s jackets we already had on the trail. These pants are available in solid black or black with gray accents. 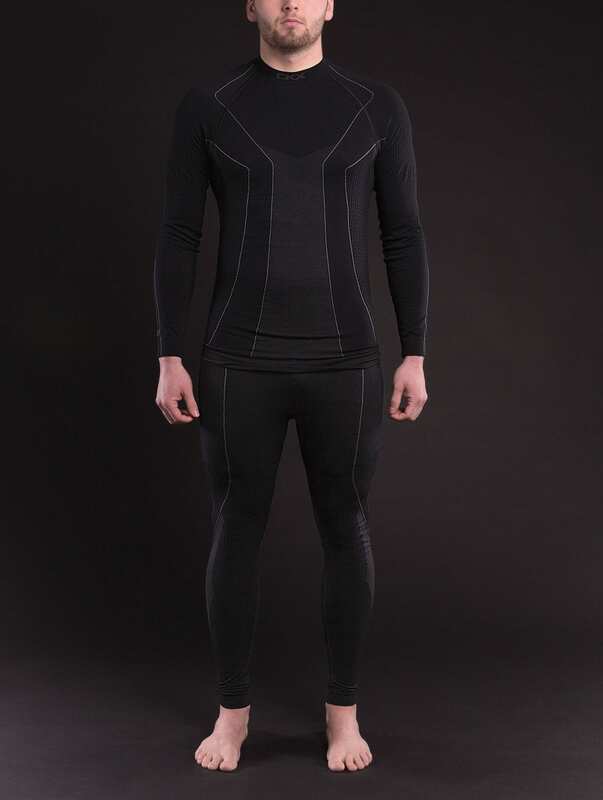 With their 180g of insulation, the Echo pants are rather specific for users who prefer an extreme heat level. They are ideal for long expeditions and for people mainly riding on federated trails. At no time were we disappointed with the heat and insulation offered by this product. By its attributes and its hermetic design, it is an ally to escape the bad weather and tough conditions Mother Nature can offer us. These pants are strategically reinforced for long-term durability and are a good investment. Since we practice our activity in a seated position most of the time, the Echo pants are very comfortable thanks to their preformed knees. Without a doubt, this is a great attention to details and creativity. The famous Titan helmet no longer needs an introduction, and is also available for the new 2019 season. 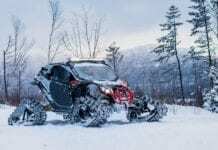 Launched in 2016, it has revolutionized backcountry riding since then. This detachable chin strap MX-style helmet with its 210-degree peripheral vision, has attracted a lot of attention since its launch. Two major configurations are available depending on the style of the riders. Its original version allows adaptation according to the activity and the degree of insulation and tightness desired. 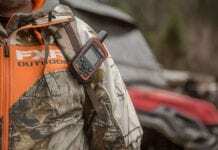 Its Air Flow version offers everything a backcountry enthusiast needs – unparalleled ventilation and protection. For fans looking for a lightweight helmet, the Titan is back again this year with a carbon fiber design. It is so light that you almost forget the fact that you are wearing a helmet. This year, we chose the Titan helmet with its new evolution – the Avalanche. This is differentiated by an even greater versatility. We can adapt it by using the accessories and the 2 goggle lenses provided. Available in five variants, it adapts easily to one or the other of the jackets we had from CKX, be it for a man or a woman. 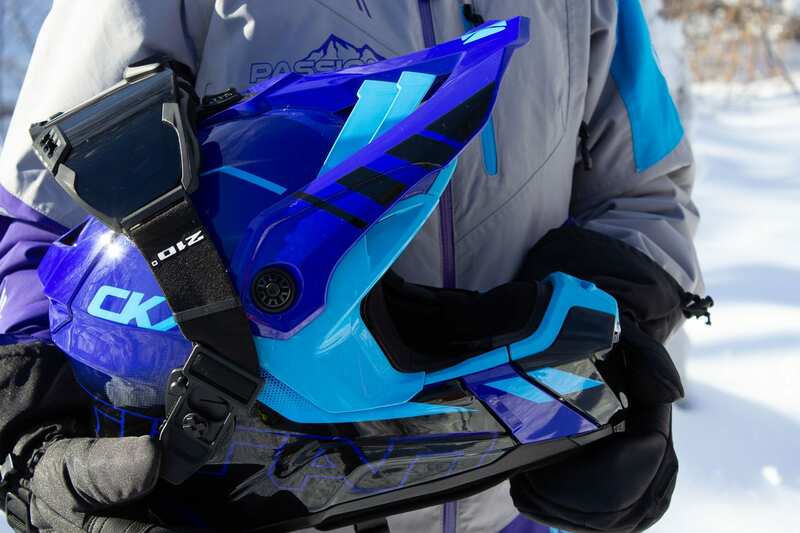 Right out of the box, the Titan Avalanche helmet is ready to use and configured to face the trails. It is configured to be basically airtight. 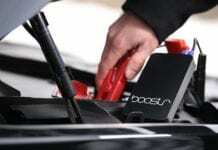 The ventilation inlets are clogged, and neoprene accessories help prevent heat loss or cold penetration. Are you a backcountry fan? Simply use the vented lens and remove the neoprene accessories to ensure ventilation for improved heat and moisture evacuation. Let’s be honest, CKX never rests on its laurels and the Titan helmet is the proof. 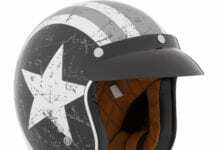 We are amazed to take note of the small details of improvement of this helmet. It is a great innovation from CKX. It should be noted, however, that in order to take full advantage of the Titan helmet, the use of the CKX hood specifically designed for this helmet is strongly recommended. It offers an adequate face opening to fully enjoy the benefits of this helmet. The 210o goggles were huge during its introduction. This goggle, by its peripheral vision, offers users peace of mind. Its integrated vents also allow adaptation depending on its use. 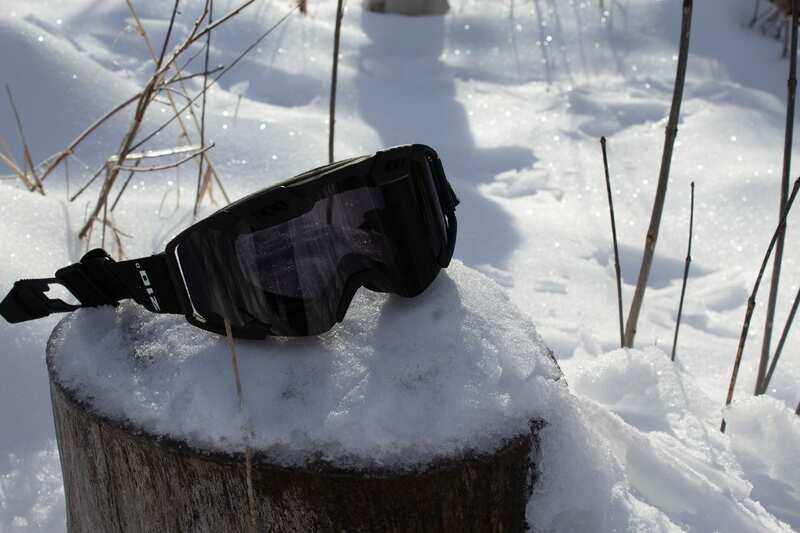 A small change has been brought to this goggle by its interchangeable lenses. It is now equipped with an optional photochromic lens. Huh? A photochroma… what? If I tell you an adaptive lens according to the intensity of daylight, it gives you a little lighter on the subject. Yes, CKX thought about it! People who wear corrective lenses may be more familiar with the technology. Now, it is common to buy a pair of glasses whose lenses darken when UV-rays increase in intensity. This photochromic lens adjusts to the external light. The patented molecules allow this visor to lighten and darken when exposed to the different levels of ultraviolet rays of the sun. It will be completely clear at night when the darkness has come and a tinted color when the light is present for better contrast on the road and to reduce the glare that could blind you. This technology allows users to continuously ride without the need to interchange their visors during the day. It’s a nice innovation, isn’t it? This photochromic lens is a nice alternative for users with sensitive eyes in very sunny weather and it eliminates the requirement to bring a spare lens with you when the sun gets darker, as it automatically adjusts to the glow of the day. In order to be able to enjoy warm and dry rides, it is also essential to wear high performance underwear for moisture evacuation. For 2019 CKX has introduced underwear with tops and bottoms designed in a knit of seamless synthetic fibers. These perfectly fit the body shapes for unparalleled comfort. This underwear has been an ally since the beginning of the cold weather, as they allow the evacuation of sweat, from the surface of the skin, to the outside. In addition, they offer thermal insulation against heat loss. They are seamless, so they prevent skin irritations. As a result, these undergarments are the first elements to consider keeping us dry at all times during our rides, and we have never been disappointed with their effectiveness. To keep our hands warm this winter, we opted for Throttle mittens. They are appropriate for our winters and recreational activities. 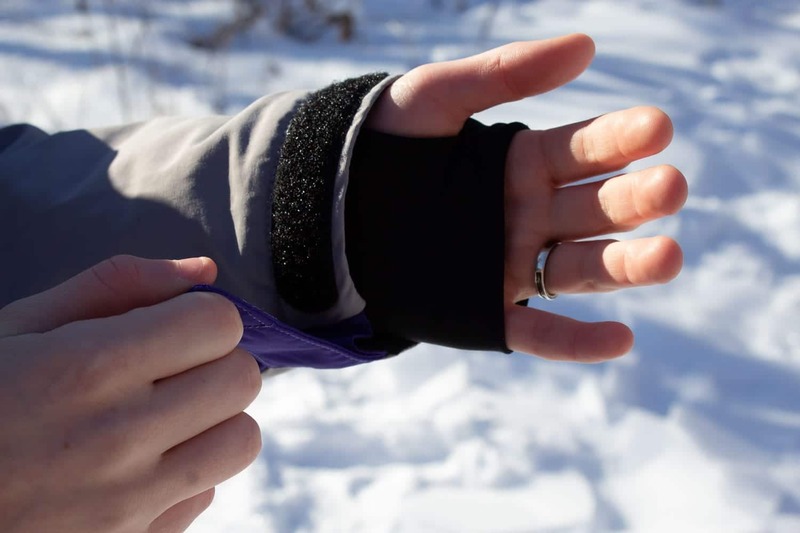 They counter the cold and offer the necessary insulation to keep our hands dry. Their versatility allows a diverse use and they are the preferred partners. The index finger of the left hand is equipped with a wiper that will let you de-ice your helmet visor without having to remove the mitten. The soft inner membrane is removable. 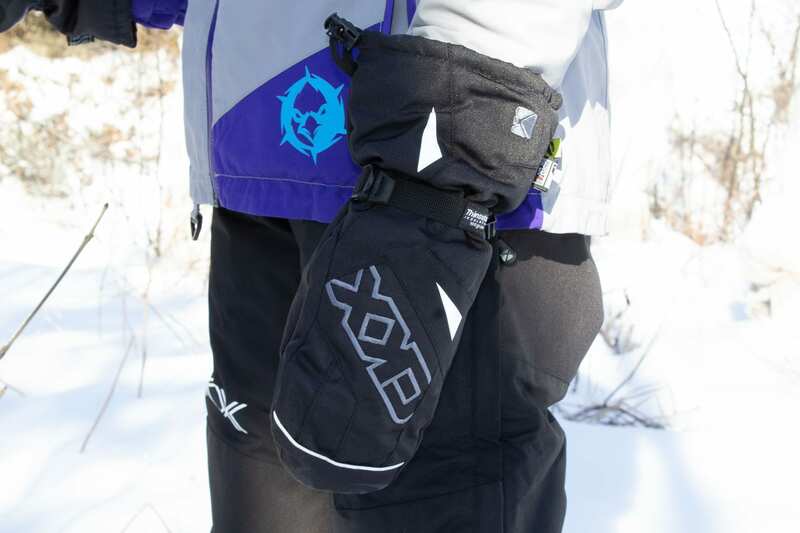 In short, we can mention that these mittens have been an asset on several occasions during our rides in cold weather. This year we set our sights on the Taiga and Muk Lites boots, known for their legendary lightness. 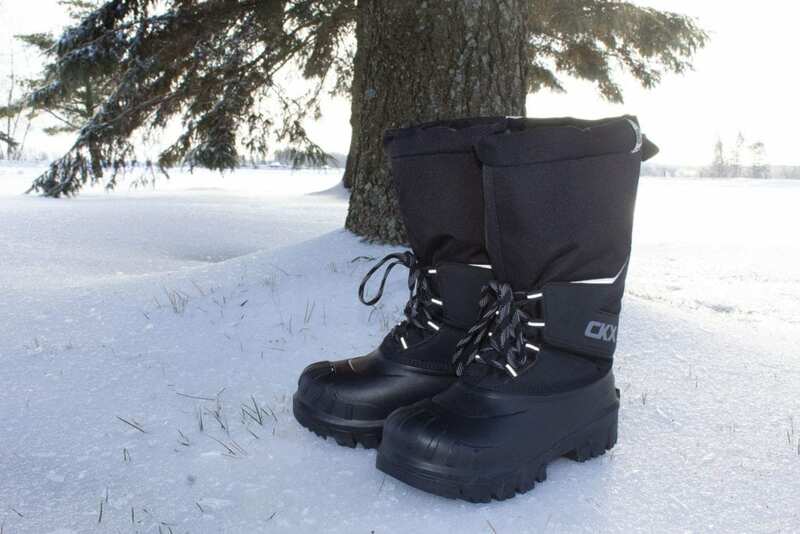 The Taiga boots weigh just over one pound each and are ideal for winter sports and winter activity enthusiasts. In addition to being lightweight, they are soft and reinforced at the ends to resist wear and to adhere to slippery surfaces. A Velcro fastener at the ankle allows a perfect fit. They have a degree of comfort down to -85 degrees Celsius, and the removable inner liner allows for moisture evacuation to keep our feet warm and dry. The Muk Lites Evo very effective boots have been revised to be even more effective. 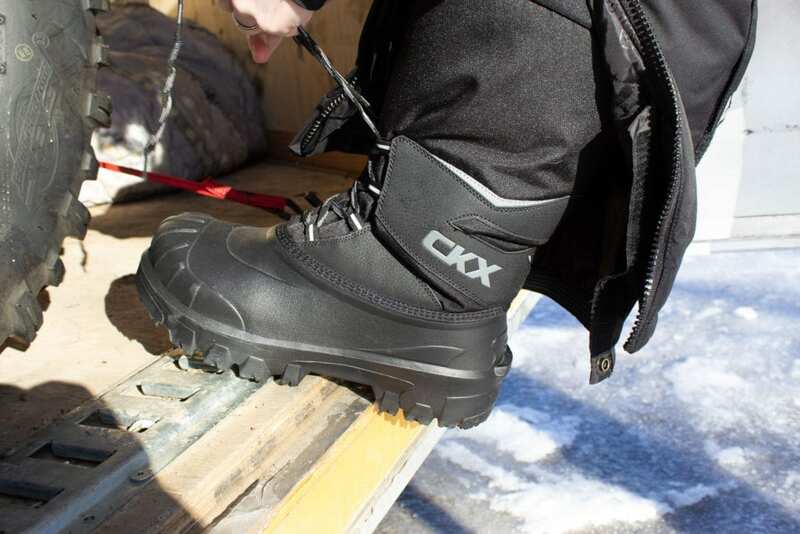 This boot, like the entire CKX line-up, is light and durable. A lace cord attaches the ankle for a perfect fit and improved support. They are also comfortable and resistant to abrasion to counter any eventuality. At the boot top, an adjustable drawstring allows a flawless fit to prevent snow infiltration and therefore keep your feet warm and moisture free. 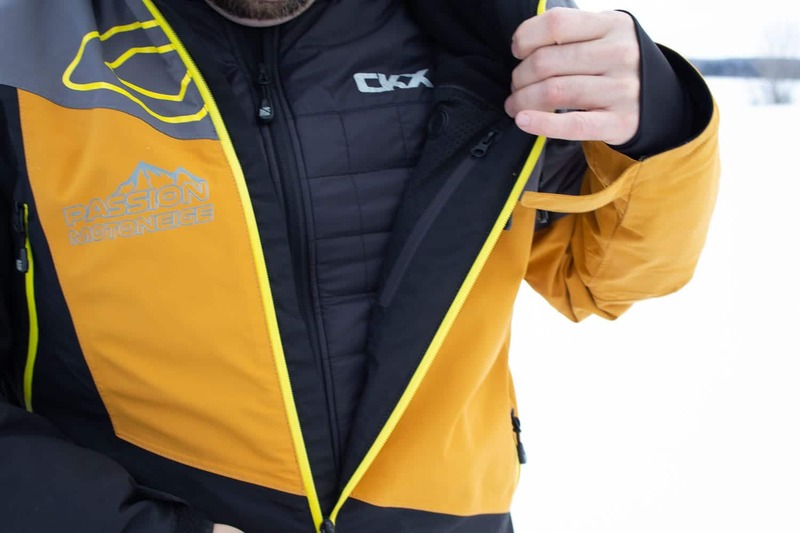 Our team has the privilege of wearing the full range of CKX clothing during the winter of 2019. They accompany us on our many outings and shootings during the winter season. Do not hesitate to ask for our thoughts when you meet us during our rides and stops at the many relays. CKX pushes the boundaries once again with this winter 2019 collection. Check out www.ckxgear.com or authorized retailers for all the details!